Now theres a security solution designed for any room in your house. The DrawerVault (GV3000) series fits and operates in most standard drawers making it the smart choice for handgun storage. 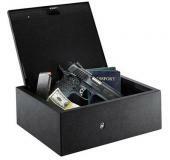 Also perfect for passports, documents, cash, or other valuables, the DrawerVault is ideal for your home or business.